Slack software is cloud-based collaboration software suite. Originally founded in 2009 as a chat tool for a now-defunct gaming technology, Slack has gained currency among enterprises and is broadening into a collaboration platform with capabilities beyond just messaging. Slack is designed to enable users to communicate easily and eliminate the "app fatigue" associated with using multiple communication applications. 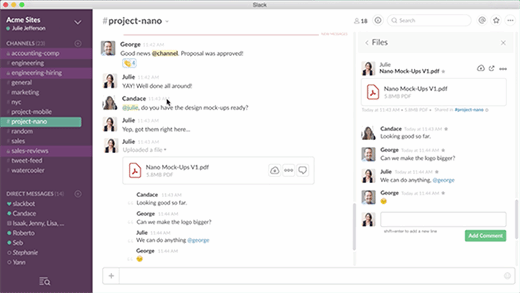 Slack is one of several online collaboration tools in the market, including Microsoft Teams, Sharepoint, Yammer, HipChat, Jive, iApple and Salesforce Chatter. The main critique of collaboration tools has been that they exist outside of the location where real work is accomplished -- forcing users to toggle between applications and making collaboration another time-consuming task. Slack features include direct-messaging capabilities, notifications and alerts, document sharing, group chat and search. Slack offers integration with many third-party services, including Google Drive and Dropbox, and it is especially popular with software developers and technology-driven companies because it supports source code snippets and retains formatting for a variety of programming languages. Slack also offers integration options for developer-oriented tools such as GitHub and application performance management services like New Relic. Slack for small teams is free with a limited range of capabilities. Slack also offers Standard, Plus and Enterprise licensing levels. Which collaboration tools are you considering, and why?